Since his beginning in 2007, Chris Askwith gently moves away from British classicism, by his style and the materials he uses. 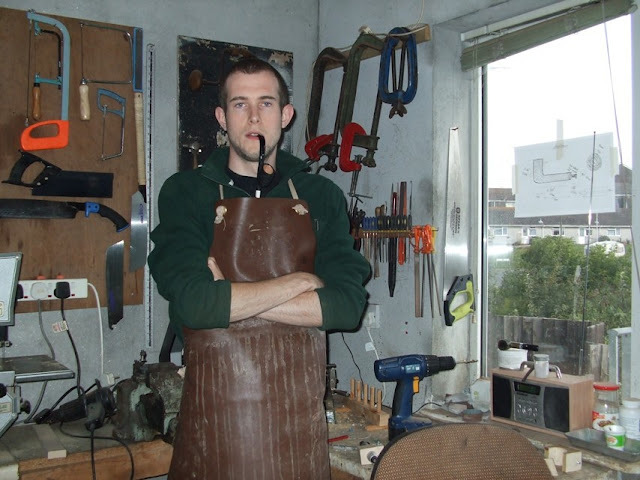 Thanks to this young pipe maker living in Plymouth, a cool wind blows on the English pipe. I bought one Askwith morta pipe ( picture above), directly on Chris website. It is a perfectly carried out smoking pipe, and a beautiful work. -Nicolas: How did you begin smoking pipe ? Chris: At first I was a cigar smoker, but pipe always interested me. I bought my first pipe on Ebay, it was an estate and I used information found on the internet to clean it up and bought myself some pipe tobacco. The first smoke wasn't that great but I persisted with it and never looked back. -When you started making pipes in 2007, why did you decide to make non-briar pipes ? I have always had a great love for wood. I love experimenting with different materials and when I found there were other woods that were often used for pipe, I wanted to try them. I never really had much desire to work with woods like cherry or walnut as people say they are not as resistant as the main three woods: briar, olive and morta. So I decided to stick with these. -Do you think that olivewood resist fire as briar does ? I have been smoking an olivewood pipe for many years now and I have found it to be just as resilient as briar. -Where does your morta (semi fossilized bog oak) come from ? My morta comes from the peat bogs of Norfolk, in the East of England. It is found when farmers plough their fields. I choose the wood myself from a large stockpile. This year, I had to sort through over 1000 logs to choose just 50 for myself, and these logs will probably make less than 100 pipes. -Is morta hard to work ? Morta is very hard, makes my cutting tools dull, wears out abrasives and sandpaper and the blocks are often split or contain flaws much worse than briar. It also smells and gets very hot when being sanded. So, yes, it is a very hard material to use ! -What is for you a good smoking pipe ? A combination of good materials, well cured and prepared, and also good engineering. I like an open draw through the whole pipe and try and make that airway as smooth as I can. -What your stems are made of ? I have used ebonite for a couple of years now. At first I used acrylic as that was easier to get hold of and cheaper to practice on. Now I use ebonite, cumberland in various colours and I also cut stems from real cow and buffalo horn. -Is there a pipe maker you particularly admire ? I admire many pipe makers and love looking at other makers work. My favourite pipe maker changes almost daily but they include Trever Talbert, Rad Davis, Todd Johnson, Tom Eltang and many others. I just love pipes ! Chris's love of, and interpretation of old English classic shapes made him an automatic early choice as a pipe carver we wanted to feature at Finest Briar. See our range of quality Chris Askwith pipes.